A new queen and royal court were crowned Saturday at the 54th Annual Miss Commerce Pageant. 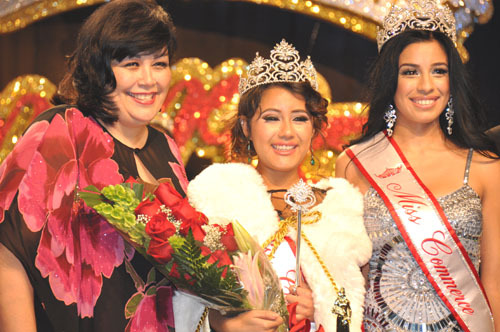 Twenty-year-old Denize Rodriguez was named Miss Commerce during the pageant held at the Commerce Hotel and Casino, and broadcast live on the city’s television channel and on the Internet. Selected from a field of 14 contestants, Rodriguez could not contain her excitement and tears as she made her first walk as Miss Commerce 2014 in front of an audience of about 350 people, Commerce spokesperson Herlinda Chico told EGP. Rodriguez attends Rio Hondo College where she is studying psychology. She works at the Citadel Outlets and in her free time she volunteers at the city’s Central Library Literacy Center. “I think being Miss Commerce will give me the opportunity to participate in social events and allow me to learn more about myself… and I will be able to give back to my community,” she said in a recent interview. Rodriguez will receive a $2,500 scholarship from the Commerce Hotel and Casino, clothes and gift cards to Citadel stores, among other items. Joining her on the royal court are Samantha Ashley Jauregui as Miss Clippers; Chloe Elizabeth Romero, Miss Dodgers and Miss Friendship; Natalie Melendez, Miss Fourth of July and Mariah Pino, crowned Miss Cinco de Mayo.